The lawyer of Eva Nováková, the former International Solidarity Movement (ISM) media coordinator, who was taken from her apartment in Ramallah on 11 January 2010 and subsequently deported, filed an appeal to the Supreme Court of Justice today to challenge the legality of her arrest. The official reason given by the Israeli authorities was that Eva Nováková overstayed her visa. However, her lawyer argues that by invading Ramallah the Oz unit, which is a part of the Israeli Ministry of the Interior, acted against the law as they do not have jurisdiction over areas with full Palestinian civilian control. The appeal was filed only hours after another two international activists were illegally arrested during a night raid in Ramallah. At three in the morning, the Israeli army forcefully entered an apartment in the Area A, city of Ramallah, and arrested two activists from the ISM on suspicion of overstaying their visas. The two, Ariadna Jove Marti, a Spanish journalist, and Bridgette Chappell, an Australian student in the Beir Zeit university, were then taken to the Ofer military prison located inside the Occupied Territories, where they were handed over to the Israeli immigration police unit “Oz”. Similarly to the case of Eva Nováková, the raid and detention of the two is in direct violation of the Oslo Accords between Israel and the Palestinian Authority, which clearly forbids any Israeli incursion into Area A for reasons not directly and urgently related to security. Miss Nováková, who lived in Ramallah, Area A under full Palestinian control, was taken when 20 soldiers accompanied by immigration officers from the Oz unit invaded her apartment at 3am, on Sunday 11 January. She was taken for interrogation at Hulon and later transferred to the Givon prison in Ramle. After two hours, however, she was taken to the airport detention facility, where her phone was confiscated and she was prevented from contacting her lawyer. Despite the efforts of the lawyer to temporarily freeze the deportation, she was put on the plane at 5.30am the next day and deported to Prague, Czech Republic. The attempts of the Israeli authorities to deport foreigners involved with Palestinian solidarity work are part of a recent campaign to end Palestinian grassroots demonstrations. The Oz immigration unit illegally arrested and attempted to deport further five international activists over the last ten months, while around ten leading Palestinian organizers have been arrested, including Jamal Juma’, Abdallah Abu Rahmah, Adeeb Abu Rahmah, Wael al-Faqeeh and Mohammed Khatib. 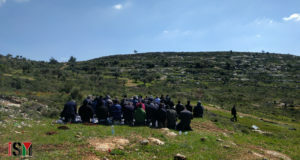 In addition, dozens of demonstration participants have been arrested from Bil’in, Ni’lin and Jayyous. The illegal practices of the Oz unit came to attention in the case of Ryan Olander, an American citizen, who was arrested in Sheikh Jarrah neighbourhood of East Jerusalem and later released without conditions, only to be literally kidnapped by members of Oz from outside the court building. Mr Olander spent one month at the Givon prison in Ramle awaiting the decision on his deportation. On 18 January 2010, the Tel Aviv District Court judge ordered to freeze Ryan’s deportation and ruled his arrest was illegal.